Red, Bike and Green seeks to strengthen bike culture within the black community. At eight in the evening on a Friday in October, a crowd of zombies gathered at Frank Ogawa Plaza, groaning for "brains." Red and white bike lights flashed like hyperactive strobes. It wasn't Halloween; it was the East Bay Bike Party, and more than three hundred people came out for the monthly ride. A speaker bike blasted Michael Jackson's "Thriller," and a woman offered makeup to help folks get their zombie on. As departure time approached, the message from the megaphone was this: "Love that right lane. Pretend you're driving in a car. Show 'em some love." Critical Mass, this is not. The East Bay Bike Party got rolling in May, and it's modeled after the San Jose Bike Party, a ride that attracts thousands of cyclists and just celebrated its third anniversary. Collective rides and bike tours are becoming increasingly popular in Oakland, which may be one of the bike-friendliest cities in the country, and they're enticing a diverse group of people to get out and ride. "There's so much out there to see, you kind of have to get on your bike to see it," said Karen Hester. Over the past two years, she has led bike tours of East Bay co-housing communities and a tasting tour connected to the Eat Real Festival. The four- to ten-mile rides are flat, and the routes stick to bike trails and backstreets whenever possible. Occasionally, a serious cyclist shows up, but for the most part her tours attract casual riders and some who rarely ride. For the event organizer and wedding planner, bike tours are "a little sideline thing that I've added to my repertoire." They combine her interests in co-housing and eating locally, and when she considers the act of sharing them with others, she says, "It's really like a piece of art." Other events have incorporated bike tours, including the Secret Gardens of the East Bay and Build it Green Home Tour. The popular Oaklandish Tour De Taco is on hiatus at the moment because its guide, Cyrus Farivar of CaliforniaTacoTrucks.com, moved to Germany. In April, Jon Zalon turned his longtime love of wine and bikes into East Bay Winery Bike Tours. When people hear about it, many react like customer Laura Ho. "I'm surprised there's wineries in our own backyard," she said. There are actually 21 urban wineries in the East Bay Vintners Alliance, and the tour stops at three or four along the flat twelve-mile route. "It's actually safer riding than Napa," Zalon said. "All my streets are either bike safe, bike route, or bike path." Zalon outfits his customers with helmets and hybrid bikes. His own bike has an Xtracycle, a cargo attachment with a 300-pound capacity — enough to carry a picnic lunch and wine bought along the way. "I wanted to do it as a totally green business," he said. He calls the ride "gritty and pretty." It leaves from Jack London Square, follows the Embarcadero to the Park Street Bridge, and crosses into Alameda. The scenery ranges from East Oakland's produce distributors and graffitied buildings to neat rows of bungalows along Alameda's palm-lined avenues. After lunch beside the beach, the tour winds through the old naval base, and riders return to Oakland by ferry. A recent trip included tastings at Irish Monkey Cellars, Rock Wall Wine Company, and Urban Legend Cellars. Zalon originally thought tourists in San Francisco would be his primary customer base, but there has been a lot of local interest. He offers a B.Y.O.B (Bring Your Own Bike) discount, and promotions with Groupon and LivingSocial have helped lure locals. A cyclist since the Sixties, Zalon became an entrepreneur after a thirty-year career in programming. It's his sole focus right now, but he anticipates picking up a little programming work during the winter months. East Bay Bike Party organizers also expect a smaller turnout in the coming months. Ashley Elliott, one of the many volunteers who organize the monthly East Bay Bike Party rides, has been an Oakland resident since 2006 and has seen the bike community change. "As the infrastructure has gotten better, the culture has gotten better," she said. This year those improvements earned Oakland a bronze-level Bike Friendly Community designation from the League of American Bicyclists. The assessment considered factors like bike infrastructure and education and the work of nonprofits like East Bay Bike Coalition and Walk Oakland Bike Oakland, as well as "signature cycling events" like the East Bay Bike Party. Boulder, Davis, and Portland are the only communities to reach platinum, the highest level, and San Francisco has achieved a gold ranking. To improve cycling in Oakland, the League of American Bicyclists urged the city to add bike lanes on busy roads, improve signage and road maintenance, and expand share-the-road campaigns and education opportunities for children and adults. 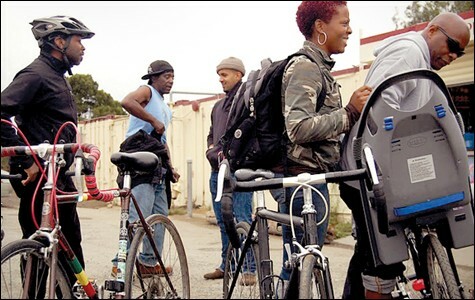 Strengthening bike culture in Oakland's black community is Red, Bike and Green's mission. Jenna Burton formed the group in 2007, but it launched officially this year with a group ride on April 24. 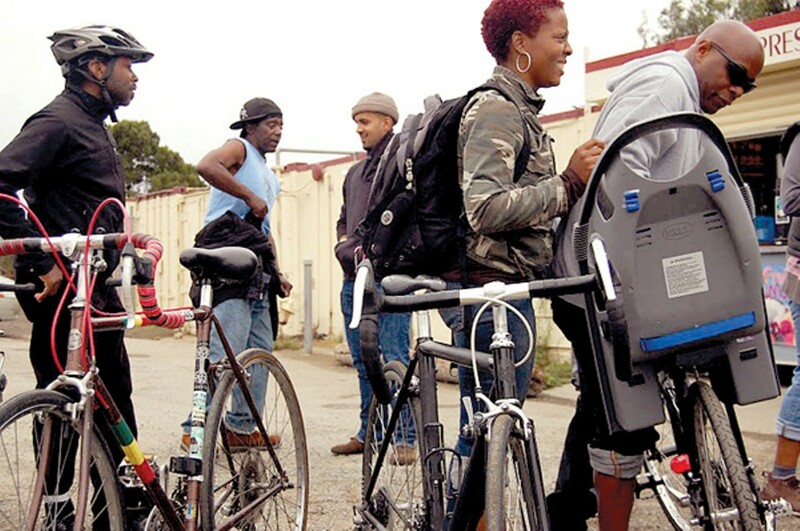 The organization's purpose is three-pronged: "to improve the physical health, individual economy and local environment of African Americans by strengthening the relevance of bike culture within the Black community." More than 50 people ages 6 to 65 participated in the first ride, an 8-mile loop that passed by landmarks significant to the black community. Organizer Nick James described the ride as a great success, an "impromptu space of activism, community art, and entertainment, as well as recreation." James does Red, Bike and Green's branding — giving the web site, flyers, and T-shirts a bold, signature look. Since April, there have been two a month with an average turn out of 45. Now that the rainy months have arrived, Red, Bike and Green will do one ride a month and use the time to strategize. The group is run by ten volunteers, and has chapters planned in Brooklyn, Philadelphia, and Washington, DC. From the East Bay Bike Party to Red, Bike and Green, these opportunities to ride are open to all, especially beginners. The East Bay Bike Party has a "no child left behind policy," a pledge not to abandon slower riders. Because there's strength (and greater visibility) in numbers, collective rides can help inexperienced cyclists gain confidence. As the recent zombie ride wound through 13.5 miles of Oakland, it made several stops for socializing, dancing, and even bike sumo in Jack London Square. Perplexed pedestrians pointed and cheered as hundreds rode by on cruisers, fixies, scraper bikes, tandem bikes, cargo bikes, road bikes, and speaker bikes. Oakland may be considered bronze, but its spirit is definitely going for gold.